04/27/2005 - Requirements for maintaining Material Safety Data Sheets (MSDSs) for coal including coal dust, fly ash, and silica dust. Title: 04/27/2005 - Requirements for maintaining Material Safety Data Sheets (MSDSs) for coal including coal dust, fly ash, and silica dust. This is in response to your December 15, 2004, correspondence to the Occupational Safety and Health Administration's (OSHA's) Directorate of Enforcement Programs. This letter constitutes OSHA's interpretation of only the requirements discussed and may not be applicable to any questions not delineated within your original correspondence. Your letter requested clarification regarding OSHA's Hazard Communication Standard (HCS), 29 CFR 1910.1200. You specifically asked about requirements for maintaining Material Safety Data Sheets (MSDSs) for coal. Your paraphrased question and our response are below. Got dust? Consider a supplied air respirator system like this one from Safety Emporium. Question: My client utilizes coal as a fuel source for the boiler in their industrial facility. Would they be required to maintain an MSDS for coal? Answer: Without additional information regarding the specific way that the coal is handled in your client's facility and assuming that employees would be responsible for transferring the coal into the boiler manually, then the answer to your question is yes; your client would be required to maintain a MSDS for coal dust. During the handling of the coal at the facility, the employees may be exposed to particulates (coal dust) which can reasonably be expected to be generated during the transfer of coal from its storage location into the boiler. The HCS requires that employers maintain and provide MSDSs to employees who use or who may be exposed to hazardous chemicals during their job operations. Since the coal dust generated during the handling of the raw material is defined as a hazardous chemical under the HCS, then they would be required to provide MSDS information to their employees. The MSDS that your client has received from the supplier of the coal will address hazards that are associated with the use of this product. The HCS requires employers to maintain MSDSs for hazardous chemicals used in their work places. If your client does not possess an MSDS for the coal used in their facility, as required by the regulation, they may select one or more of the following options by which to obtain one. The HCS allows for the use of "generic" MSDSs for products/complex mixtures with similar hazards and characteristics. There are private services available that can provide these data sheets for your client's use. Employers may also develop their own MSDS. The requirements for performing a hazard determination and for MSDS content can be found in paragraphs 1910.1200(d) and 1910.1200(g) respectively. 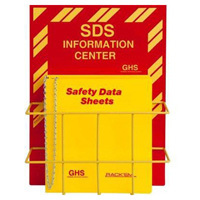 Additional guidance on the preparation of an MSDS can be found in OSHA's web site. Lastly, the employer may request an MSDS for coal from the mine itself. The Mine Safety and Health Administration (MSHA) promulgated a hazard communication standard (30 CFR Part 47) for their regulated community. This standard can be found (in its entirety) at http://www.msha.gov/30cfr/0.0.HTM. This standard addresses the provision of hazard information to the customers of the mine. Subpart H of the rule (30 CFR 47.73) requires that, "For a hazardous chemical produced at the mine, the operator must provide customers, upon request, with the chemical's label or a copy of the label information and the chemical's MSDS." Regardless of the process used to obtain the MSDS information, your client would be required to maintain MSDSs for the hazardous chemicals used at their facility. The OSHA HCS applies to places of employment where employees may be exposed to hazardous chemicals during normal operations and/or during a foreseeable emergency. As stated in the OSHA regulation "... The chemical manufacturer, importer or employer evaluating chemicals shall treat the following sources as establishing that the chemicals listed in them are hazardous: 29 CFR Part 1910, Subpart Z, Toxic and Hazardous Substances, Occupational Safety and Health Administration (OSHA)." Coal dust is listed in 1910.1000 Table Z-1 and is automatically considered as a hazardous chemical for the purposes of hazard communication. Your letter also inquired about hazard communication/MSDS guidance for fly ash. Fly ash (coal ash) is a by-product generated by coal combustion. Industrially, fly ash is used as an additive/filler during the manufacture of cement. Most fly ash is eliminated as part of the flue gas. Industries that burn large amounts of coal can extract the fly ash from the flue gas and recycle it to be used in the cement manufacturing industry. Depending on the type of coal being used, the fly ash may contain between 15% and 60% silica. Since silica is also regulated by OSHA (see 1910.1000 Table Z-3), "fly ash," which can result in exposure to silica dust, is also considered a hazardous chemical for the purposes of the HCS. As previously discussed, the requirement for compliance with the HCS is dependent on the chemical being defined as a hazard and whether or not there is potential employee exposure. If your client's facility collects and recycles the fly ash generated from coal combustion, and if employees are or could be exposed to it during the course of their work, then your client would be required to include this product as part of their comprehensive hazard communication program. Thank you for your interest in occupational safety and health. We hope you find this information helpful. OSHA requirements are set by statute, standards, and regulations. Our interpretation letters explain these requirements and how they apply to particular circumstances, but they cannot create additional employer obligations. This letter constitutes OSHA's interpretation of the requirements discussed. Note that our enforcement guidance may be affected by changes to OSHA rules. Also, from time to time we update our guidance in response to new information. To keep apprised of such developments, you can consult the website at http://www.osha.gov. You may also contact OSHA's Pittsburgh Area Office at (412) 395-4903 for any future questions you have regarding work place safety and health.